Technically this isn’t a true Monday Quote or a quote at all, but I think it is a very important word. Last week I missed our normal quote because my husband was ill. Fortunately he’s doing much better now and is out of the hospital. It was a rough few days but holding on to the belief he would be okay, and everything would work out got me through it–that and a little help from my friends! 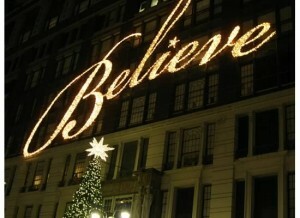 The thing to remember though is we need to have faith, trust and hope…we need to BELIEVE. We need to remember when things are the darkest, and it seems like everything is going to hell that if we truly believe it will get better. Maybe not today or tomorrow or as soon as we’d like, but it will. I believe and I hope you all will too. This month I’m going to try to find my “Christmas Spirit” and believe and share the joy and hopefulness with all of you. If you have quotes or stories you want to share please comment. I have several friends going through some very hard times this year, as are many others around the world. It’s been hard few years for a lot of people. I hope you will try to believe, no matter what your faith, and I wish nothing but the best for you all. Many of you may recognize this image. It is Macy’s Times Square in New York City. I took the photo in 2010 when I was celebrating my oldest daughter’s wedding. The message was true then and it is true now.